Fitness challenges are no longer just confined to marathons or climbing mountains, these days you can scramble your way through a muddy obstacle course or do a triathlon that involves yoga and HIIT. But what about running up skyscrapers? It's known as tower running and it's slowly taking off. All over the UK and across the world, there are events challenging people to run (or realistically walk) up dozens of flights of stairs in the name of exercise and charity. And for good reason too - it's a seriously great workout. Races include the 1,576 steps of the Empire State Building and a dash to the top of the Eiffel Tower. 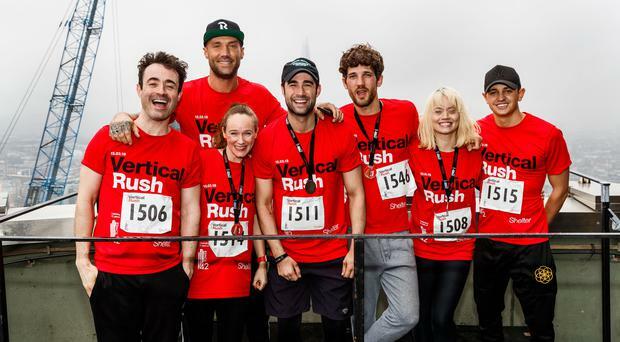 While in the UK, Vertical Rush celebrated its 10th anniversary at London's Tower 42, and with 12,000 participants and thousands raised for homeless charity Shelter, it's certainly popular. Why is it such an effective workout? It's high-intensity exercise for a short period of time, so burns a lot of calories quickly. It's also very effective for toning lower body muscles in the legs and glutes. There are some major advantages to running up stairs instead of on a flat road as well. "It's lower impact than running," says Patrick Gallagher, head of Tower Running UK. "So it's a great alternative for those who've experienced joint injuries or are looking to build up their strength and fitness as they return from an injury. "Typically it's said to burn the same calories as jogging in half the time and, because it's a high-intensity activity, you can also get a lot done in less time." For beginners, stair climbing combines toning, fat burning and cardio into one swift workout. "Your rate of perceived effort doesn't even have to be that high for you to benefit," adds Gallagher. For more serious athletes, it could really help improve performance in other sports like athletics and triathlon. "The improvements to lactate threshold, quad, glute, core strength, leg speed and mental strength, ability to tolerate pain and keep going, are really substantial," says Gallagher. What's it like to climb a skyscraper? Despite the fact walking up (some) stairs is a pretty regular occurrence for most of us, climbing multiple storeys gets surprisingly tough, surprisingly quickly. I took on the Vertical Rush at Tower 42, one of London's tallest skyscrapers, involving 42 floors, or 932 steps. Unless you're a professional athlete, you probably won't be running hundreds and hundreds of steps, though. The most effective method is a fast walk, two steps at a time, pulling yourself up with the handrail and taking tight turns on the landings - sound advice from Gallagher that I attempted to put into practice. But stairwells are weird places - usually windowless, cramped and drab - so running a 10k in a grassy park does have that advantage. There is literally nothing to look at except your feet on the stairs. And it's tough - really tough. I can run long distances, but walking up 42 floors was a totally different kind of workout and in many ways, harder. I was out of breath after five or six flights and exhausted for the rest. Many people notice a sore throat during or after the race, which Gallagher says is due the much higher levels of air rushing into your mouth because you're breathing so hard. "It can cause micro damage in your throat, hence the soreness and post race cough," he explains, but it's just a nuisance rather than anything to worry about. A tower race is over quickly though, I finished in 9:24 minutes, while the winner sprinted it in 4:38 and the slowest time was 35:56, so there was a real mixture of abilities. Some famous faces gave it a go too, including Calum Best, Gabby Allen and Kimberly Wyatt. Strictly winner Holby City's Joe McFadden completed it in 8:37 and said afterwards: "Despite the aching legs, I'd do it all over again." The beauty of stairs is that they're everywhere and they're free to train on. It's a quick workout, so for anyone simply looking to move more, and just 10 or 15 minutes of stair climbing regularly could make a big difference to your fitness. For people with a reasonable fitness level already, it can be a new challenge. "You can conceivably plod around a 10k with minimal discomfort, but even just walking almost 1,000 steps slowly, will ask a lot of you physically," says Gallagher. "There's also something appealing about going up, rather than across. On the face of it, it sounds more challenging when you tell people, and there's a nice feeling of accomplishment to walk around a city and see the skyscrapers and think, 'I climbed to the top of that'." If you're extremely fit, some seasoned tower runners attempt the 'vertical mile' - someone even ran Tower 42 a total of 12 times back-to-back at this year's Vertical Rush. And if nothing else, at the top of almost every skyscraper is, of course, a wonderful view.